I cannot tell you month we got our fiddle leaf fig, or where we even got her (our local nursery, I think) but it was at the height of the fiddle leaf’s time on the trend train, a train I tell you, that’s still going chugging along and running strong. I remember the first time I saw this gorgeous plant. There she was greeting us with a green smile in one of our favorite brunch spots, You Say Tomato, towering in a planter the size of a small boulder, her branches strong and fruitful, her leaves large and emerald. She was mammoth and full of life, and I needed to know her name. In the rush of mothering and life, I forgot to look her up and we parted way, and then one day on Pinterest she popped up again sitting in the sunny window of an old Southern home, a saltbox colonial in fact, similar to ours. Like the plant in the little cafe I admired and grew so fond of, she was vibrant and beautiful, adding just the right amount of green in a room that was otherwise a layer cake of neutrals. This time, I thought, I was going to find one and bring her home. Sourcing plants in the Midwest can be a tricky endeavor. Tropicals don’t typically do well here unless their environment is shifted a bit to suit their specific tropical needs, and desert plants, while easier to grow for those with blacker thumbs than most, are not quite my cup of tea. I love a good cactus in the right space, just not in mine. And that’s fine. My best friend, a lover of cacti, would beg to differ, as her home is an oasis for the prickly plant and she pulls it off incredibly well. I am not team-cactus, and instead, prefer more flowing varietals of indoor plant life–ivy, ferns, and fiddles, it appears. Alas, I found a fiddle leaf fig, like I said, I think at our local nursery but I cannot be sure. My mother-in-law Carol had recently got me a new planter and she was the perfect size for it. Once home, I found her a spot in our sunny fishbowl bedroom, a space where the midday sun would reach her leaf lungs, not too direct but enough to warm her and fill her insides with sunlight. I watered her somewhat regularly, sometimes fed her organic plant food, and made sure to keep her leaves somewhat dust-free. “Some” being the key word here, as I really ignored her most of the time and just let her going on living her precious fiddle leaf life. The most consistent thing I’ve done over the years however is not move her, not out of vast knowledge of said plant, but because she has always loved this corner in our room, and I have loved waking up to green leaves each morning. And that’s what I’ve found fiddles love most, to not be moved. If you get a fig and do anything at all, just leave her be. Give her a home and keep her there in a spot sunnier than most, with a nutrient dense soil, clean water, and food made without toxins or chemicals…all things both you and I need in life to thrive. While my fig has been happy for years in this old home of ours, I reached out on the gram recently and asked you with happy figs to tell me what it is you do to keep yours alive and well. I have heard they can be a finicky plant, and I was curious to see if the variables for keeping them happy would differ drastically from home to home, homemaker to homemaker. Below is a condensed report on my findings, and for those with fiddles who are looking a bit glum, or for those who want to get one but haven’t felt confident when it comes to year-round care, this is for you. It’s also a reminder for me to feed this old girl this week and give her leaves a lustrous shine! 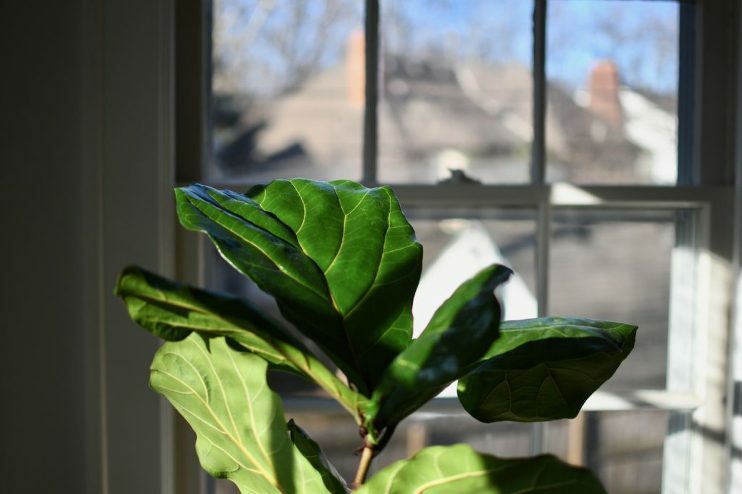 Don’t Move, Rotate | Fiddle leaf figs are rather happy adapters to most sunny environments you put them in. Not direct heat and sun, but sunny to be sure. But one thing they do not care to do is be moved. You can rotate the pot they are in every now and again to make sure all the leaves are getting enough light and equal sun exposure, but do refrain from picking them up and moving the plant to a new location or home unless you have to. These plants are excellent at feeling out their environment, but once they do, they prefer to stay, sinking into the rhythm of light that this particular sunny spot offers. Clean Leaves, Removing Dust | This tip is a biggie. Dusty leaves means that the plant cannot absorb sunlight or carbon dioxide, and therefore cannot breathe. The leaves of plants act as their lungs, letting enough light and CO2 in to live, and by never cleaning off the leaves you are slowing down and/or preventing this natural process. Take a damp cloth and carefully wipe the leaves of your plant once a month, or at least once a season, to prevent dust build up. Water Consistently, Not Often | Here is where some of you disagreed, but most went in this direction, which is to water consistently but not often. Instead of watering in small increments weekly, opt to water her well once a month on the same day if you can. I take my fig to the shower and give her a long soak under the water until the soil is moist, usually watering around or on the first of the month to keep things consistent and so I remember! She’ll tell you she needs less water if her leaves begin to yellow and drop. Ps. You can use a moisture meter to check soil if you are unsure of whether to water or not, but I think your intuition will suffice. This all being said, some of you said to water your fig once a week with 2 cups of water. I think consistency here is key! How much do you water fiddle mums? 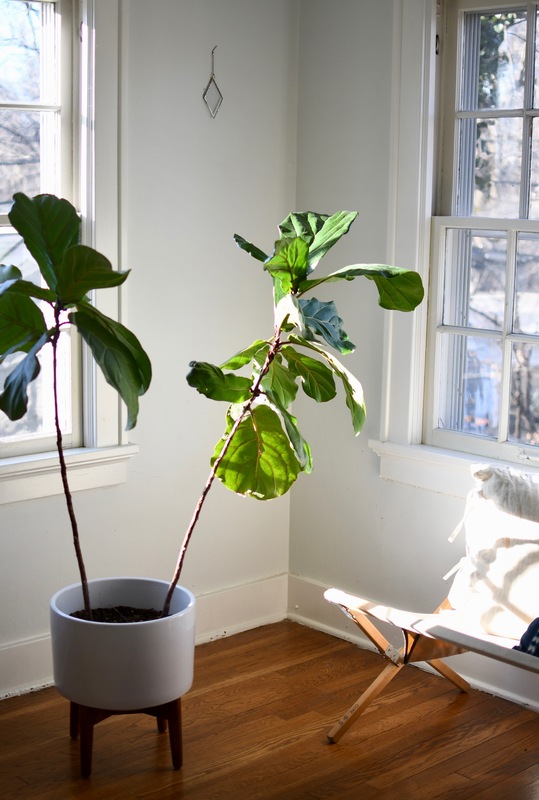 Humidify In Colder Months | For those who do not live in a naturally humid climate, use a humidifier regularly during the chillier months to keep the air around your fiddle leaf fig humid. Figs do not like cold, dry air and will drop leaves like nobodies business if the air is not humid enough for them. Make a Sunny Home | Make a sunny home for your fig by placing her near windows. Give her light! These plants love sunlight and will thrive if given enough of it. Choose a window or row of windows to set her in front of, and make sure she sees a fair amount of light each day. She’ll tell you she wants more light if she begins dropping leaves and looking droopy. If you live in a darker home, give her the sunniest spot you can find, and go from there. Fertilize Naturally | I cannot recommend natural or organic food enough, as anything else is basically feeding your plant a cocktail of chemicals. Choose a fertilizer that you trust, and feed your fig once a season. Keep Clear of Drafts & Vents | Do not give your fig a home by moving air, i.e. drafts, vents, high traffic, etc. Remember, their leaves are their lungs and too much moving air (especially if dry) will hurt them. Choose the Right Planter | Make sure whatever planter you choose it is big enough for the fig’s roots to grow. Our planter does not drain and I haven’t found that to be a problem, but the size is important. Too little and the roots will suffocate! The more space you give her to grow, the bigger she’ll get. 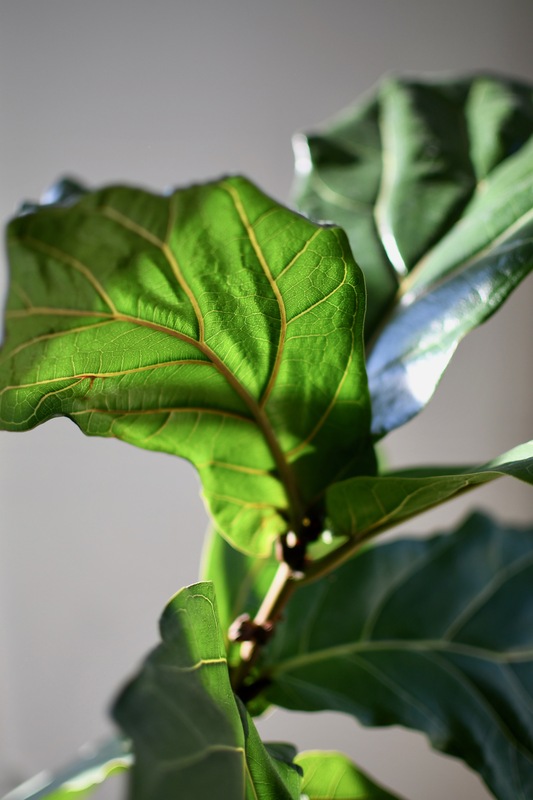 Do you have a fiddle leaf fig in your home? What tips do you agree are essential, or perhaps what others do you have to add? !